Happy Home Wallet project aims to rediscover sustainable ways of living and to make it practically, we will deliver some workshops about a range of topics covering that aim. In preparation for our international workshop in Ostrava about “Private consumption patterns and its impact on the local economy” we were researching about consumption patterns and we did a survey in our area to find out how “the average person” behaves. To balance the family budget, it is probably necessary to review our consumption, reduce waste and reorganize our resources. Above the pure measurement of private spending it’s worth to explore what influences consumption and how that reflects in certain lifestyles. Life styles can be defined as patterns resulting from shared values. Life styles are not institutionalized but can turn into new sub-cultures by developing in that way. That fine distinction is essential for consumer research to understand values which rates to consumption and how to influence them, in good or bad. Consumption is, next to socio-economic factors such as education, financial resources of income, influenced by personal values (inculcated by the parents, teachers, friends, society, culture, etc.) beliefs, motivation, interests, age, activities, availability of time, brand perceptions and media exposure behavior. Increased income and time available for leisure created lifestyles that are more self-oriented and leisure oriented and combine other than traditional values. 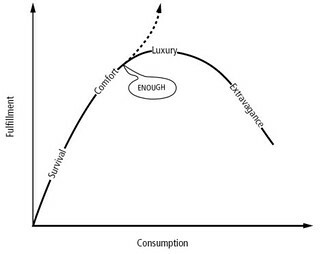 Understanding the values underlying different life styles and subcultures are necessary to change consumption patterns. As an exercise, arrange the 18 terminal values, followed by the 18 instrumental values, into an order “of importance to YOU, as guiding principles in YOUR life. Hedonism: a pleasurable, enjoyable life, happiness and contentment Related consumption patterns are .e.g, drug culture, sexual freedom, human potential movements, a personal shrink of all consumption efforts aimed at replacing societal norms with an assurance of being right with one’s self. Etherealization: means the substitution of symbols for things as objects of value for inner harmony, a world of beauty, culture and art. Consumption patterns follows disenchantment with the value of capital accumulation and with an unwillingness or inability to work hard enough to acquire “things.” Symbols instead are relatively costless. That lifestyle increases fundamentalist religions, religions based on mystics and poverty, natural foods, ecology and natural beauty. Community: true friendship, equality among men People seek to replace old value norms with new ones by clustering with other persons perceived to share similar values, rather closed, e.g. ethnic and religious community, youth-gangs, criminal gangs, flower-power groups, urban communities, etc. Forming a physical community is a technique for institutionalization that could lead to a subculture with a normative set of values and an institutional structure for reinforcing these values. Activism: a lasting contribution, social consciousness. A community organized for political activism where the physical creating of a community is not possible. I found that classification very interesting, especially when you think about how to influence and/or change consumption patterns. The continuous growth of our economy changed the way we are living and working dramatically. We did a survey in our region, asking anonymously about consumption habits and we received 49 responses which proves the above statements. Check the details in the attached file (it’s in French, but easy to understand, I guess).